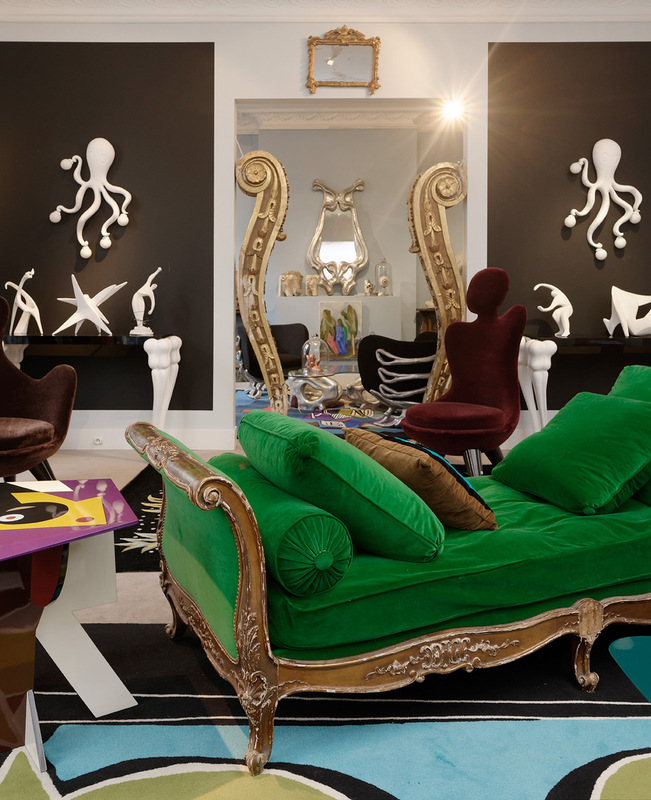 Anyone who has ever wished for an invitation chez Vincent Darré need only head to the Paris auction house Piasa, where the contents of his imaginative, plush Paris home have been restaged throughout the second floor viewing rooms. The buoyant designer and furniture decorator has made a sweeping purge of pieces from his own collection, which Piasa will sell on 23 November. 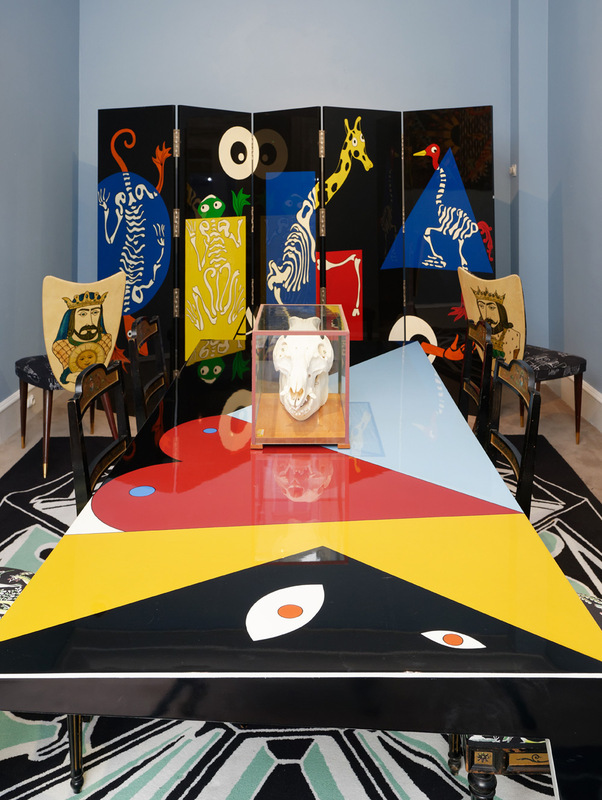 As the marvellously surrealist yet tasteful mise-en-scène makes clear, the auction consists of notable Maison Darré designs and personal effects alike; his ’Conversation’ armchairs (both with their ‘heads’ and ‘guillotined’), the Calder-inspired mobile lacquered tables, the ’Ossobucco’ bone-legged series, and the rose gilded ’Colonne-Ecrevisse’ upright shrimp cabinet are all up for grabs, as are a pair of shoe sculptures by Yayoi Kusama (from 2001), various portraits of the designer, anatomical curios and antique finds spanning from the 1800s through to the mid-20th century. A quick online search will yield photos of his apartment for those seeking proof that all this – and so much more – coexisted in a single apartment. Perched on the ’Petit Prince’ metal-framed bed, its tented fabric covered in Darre’s Dalí-esque motif for Pierre Frey, the designer tells Wallpaper* that the sale represents the end of one era and the beginning of another, which will be marked by the opening of a new apartment-style space opening on rue Royale next year, in addition to a retrospective book. ‘I want to truly create a universe, rather than just showing my work. 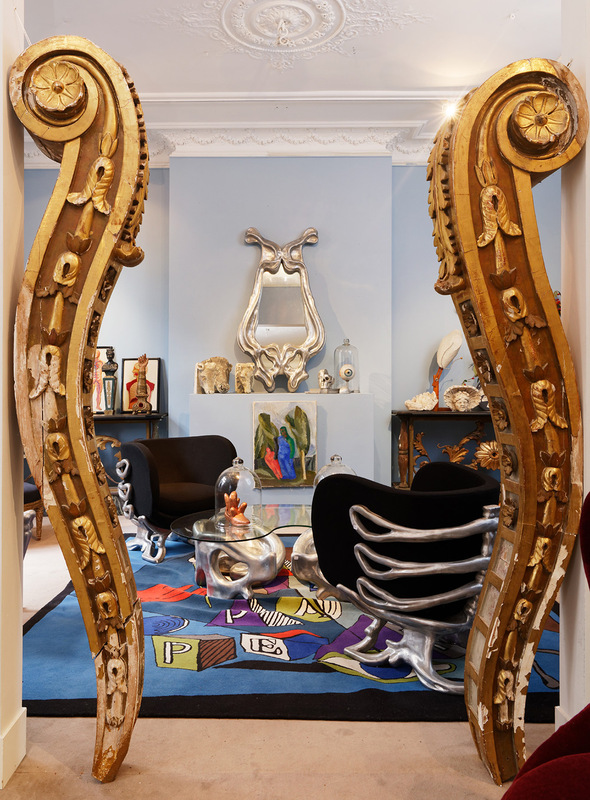 We’ll mix it all and it will really feel like a home,’ he says, implicitly comparing the forthcoming project to his previous showroom on rue du Mont Thabor. To be sure, the exhibition further reinforces the inseparable overlap between his public-facing and private domains. Often referring to his apartment on rue de Bellechasse in the 7th arrondissement as the ‘laboratory of my dreams’, Darré insists he has no plans to uproot. Rather, he says the elimination process had the cathartic outcome of a blank canvas to paint fresh. Prospective buyers, meanwhile, need not be reminded of the provenance factor – that the pieces belonged to someone who embodies unparalleled Parisian flair. Darré remains modest on this count, except to offer that many of his designs are ‘the last of their kind’ and that the catalog ‘gives some meaning to my career’.